Fight for decent housing for all! Lewisham Hospital campaign - a turning point in fight against NHS cuts? Imagine you are a council tenant, and you have lived in your current house or flat for years. In an interview with the Mancunion student newspaper (5 Nov), National Union of Students President Liam Burns says of the 2010 siege of Millbank Tower that “occupying a locus of power is not a disproportionate response to the trebling of fees”. This is a welcome progression from the outright condemnation of his predecessor, Aaron Porter. But Burns also says that he has planned the 21 November NUS demonstration to bypass Millbank and avoid anything similar. He is worried about “the danger of violence”. Young Tory louts have put out a call online to disrupt a Workers’ Liberty student forum on Thursday 15 November about the meaning of the First World War. Workers’ Liberty member Daniel Cooper was invited to lay a poppy wreath at an official Remembrance service, in his capacity as Acting President of the University of London Union (ULU). Daniel declined, on principled grounds — that the official remembrance service is a pageant of nationalism, monarchism, and militarism which celebrates the institutions which organised the First World War. Rank-and-file civil servants are taking part in walkouts and protests on 14 November. This is not only to coincide with the general strikes across Europe, but to draw attention to government attacks on terms and conditions. The day of action follows a wildcat walkout at HMRC in Coventry, in response to a visit by Cabinet Office Minister Francis Maude. 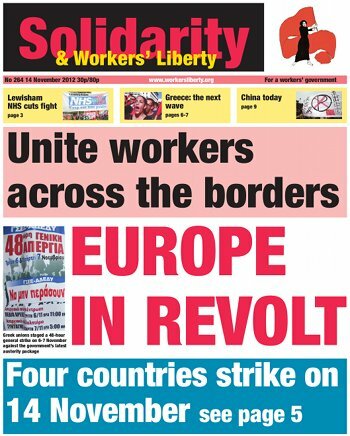 Already the development has forced movement from the union leadership, who have called a follow up day of action on 30 November. The media arm of Richard Branson’s Virgin Group empire announced on 7 November that it plans to derecognise unions organising at the company, including the Communication Workers Union (CWU). Virgin is offering an internal “Voice Forum” as an alternative staff representative, and will ballot employees on whether they wish to be represented this body or by an independent union. A CWU statement said: “It’s self-evident that a company’s own ‘employee forum’ cannot possibly be as independent as a democratically accountable trade union”. Hundreds of firefighters lobbied Parliament on 7 November to protest against huge cuts threatened to fire services across the UK. Around 1,500 firefighter jobs have been cut over the last year and with central government grants getting slashed, local fire authorities are planning around 6,000 job cuts by 2015. Teachers at South Shields Community School in Tyne and Wear struck on 7, 8, and 13 November, as part of a planned series of strikes which will also see action on 14 and 15 November. Members of teaching unions NUT and NASUWT at the school escalated the unions’ joint national campaign of industrial action short of strikes and voted to walk out after the school management refused the unions’ demand of a three-per-year limit on classroom observation. On Monday 12 November, the Industrial Workers of the World union (IWW) launched a fresh pay dispute on behalf of outsourced cleaners at John Lewis. This follows an IWW cleaners’ strike at John Lewis in Oxford Street earlier in the year — the first strike in John Lewis history. In the run up to Christmas and January sales, John Lewis can expect to see profits spike, bringing in millions of pounds. Meanwhile, cleaners working in their buildings are earning minimum wage of just £6.19 an hour.